This charming collection of 19 poems celebrates trees in all their variety. With a playful, kid-friendly sense of rhythm, respected poet Florian turns the book on its side, presenting the poems and illustrations vertically, to emphasize the height of each tree. Loose, easy watercolor and oil pastel paintings on brown bag and recycled papers lend a relaxed feel. Beginning with the concrete poem Seed, in the shape of the eternity symbol, ∞, implying the infinite possibility that each seed harbors, the book goes on to celebrate Giant Sequoias, Scribbly Gum, Banyan, Paper Birch trees and more. I loved the poem about the coconut palm which reads in part, "I'm nuts about the coconut./I'm cuckoo for the coco./ I'm crazed for this amazing nut./For coco I am loco." accompanied by a picture of a man with a coconut tree growing out of his head. Whimsical, short and full of puns, these poems will appeal to second through fifth graders with a sense of humor. The book is appended with a "glossatree" presenting additional scientific facts about each of the trees mentioned in the book. Great for poetry units, or as an addition to a science curriculum, this is a book sure to please, don't miss it. Yes, I'm hosting Poetry Friday this week! Kurious Kitty is sharing Amy Lowell's "Monadnock in Early Spring"
Laurie from Book, Blog, Fun is sharing a poem of her own! Sarah from Read, Write, Believe asks, "Are poetry slams a nuisance?" Irene Latham shares poetry craft tips! Author Amok has a serious poem, "Liam Sits Folded"
Father Goose shares an original poem, "Art Show in the Park"
Gregory K. from Gotta Book has some more clerihews! Today is poem #8 in my attempt to write a poem a day again this year. Yesterday, my poem was about the destructive power of words. Today, I'm celebrating my favorite words to hear. Good morning! My Poetry Friday post features poetry by Linda Pastan. Random Noodling has a poem by Linda Pastan, too! Kurious Kitty has Amy Lowell's "Monadnock in Early Spring" and, Kurious K's Kwotes' P.F. quote is by Amy Lowell. Hello, early risers! I'm in today with a poem by the British star Alice Oswald. I even wrote a short poem for my Poetry Friday post. This is a 1st. I've posted a poem about writing a poem at TeachingAuthors.com: http://www.teachingauthors.com/2011/04/poetry-poetry-poetry-month.html. Today I am featuring a fourth grade class's publishing center along with some of their poems and a lesson about circular poems. I'm in with a review of PEARL VERSES THE WORLD, a terrific new novel in verse about a child who uses poetry to make sense of her world. Are poetry slams a "nuisance" as one poet claims? I went to one at my local high school to find out! Plus, a preview of documentary releasing next month about four students and the world's largest poetry slam, "Louder Than a Bomb." Are Poetry Slams a Nuisance?" Cooking up lots of lasagna today with Heidi Mordhorst: http://jamarattigan.livejournal.com/528195.html. Buon Appetito and thanks for hosting! dourglas florian, can't go wrong. i've rounded up my daily twitter blues haikus (and a couple extras) this week. Here's my Poetry Friday post for today: here. Thanks for hosting! William Carlos Williams and a painting by Adrian Coorte: a couple of tiny gems. Thank you for hosting! PS Most of the trees around my house are named: Noah, Marie, Eleanore, Birdy, Archer, Fern, Grace, and Crabby Appleton. Hi, all! The Write Sisters are in this week with Eletelephony by Laura Elizabeth Richards. Fun to memorize! Hi, Madigan. Thanks for hosting! I'm featuring Maryland poets during National Poetry Month. Today, it's special education teacher and poet Ann Bracken. Her poem, "Liam Sits Folded," is one of a series of heart-breaking student portraits. Thank you for hosting, during busy Poetry Month! For the rest of April, I am writing at a haiku a day to accompany photos taken while I was traveling in Thailand and Cambodia earlier this year. Thank you for hosting Poetry Friday! Thanks for hosting! I'm continuing with my daily poetry tag series of connected poetry book reviews-- today, a digital trailer for WHAT'S FOR DINNER. And I'm wearing TWO hats today-- plugging my new e-book of poetry for kids (for just 99 cents), PoetryTagTime, with daily blog tips. Today: Helen Frost! True poetry comes from the heart ! I enjoy listening and reading from Authors who care about their art. At Wild Rose Reader, I have a short review of Marilyn Singer's book "Twosomes: Love Poems from the Animal Kingdom." I also have some of my own original "cuddly creature couplets"--and an invitation for people to write their own "twosomes" and submit them in the comments at my post. I'll post the couplets people submit sometime next week. BTW, I'll be giving away a copy of "Twosomes" next week at Wild Rose Reader. 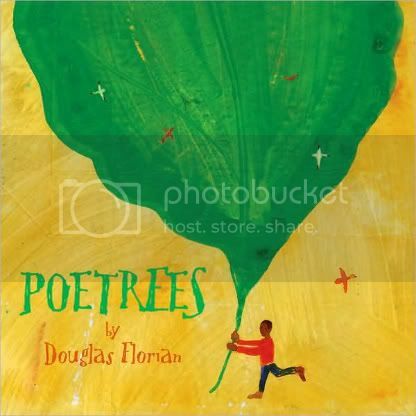 Later today, I'll announce the winner of Douglas Florian's POETREES. Thanks for hosting today! I love Florian, and will look for this one. At "A Teaching Life" I've posted two poems which relate to our Social Studies unit on slavery. Here's a wonderful combination of an engraving by Durer and the poem it inspired by Stephen Mitchell. Thanks for bringing us all together today! At Blue Rose Girls, I have three original clerihews about Eve, Socrates, and Sir Isaac Newton. Thanks for hosting. Love that book. I'm in with art from four new children's poetry titles (and a link back to last week's reviews of them at Kirkus) -- http://blaine.org/sevenimpossiblethings/?p=2113. Thanks for hosting. It's been a week full of poetry at GottaBook, ending with today's offering of a cluster of clerihews by Avis Harley. Hi, Madigan, thank you for hosting. I'm in with the Oakwood School Grade 6 Poetry Project, wherein the students wrote reaction poems to MARE'S WAR. Thanks for hosting, Madigan! I'm in with my 8th haiku/haibun of the month! Thanks for hosting, Madigan. I, too, liked Poetrees. Today, I'm in with a review of Arnold Adoff's marvelous book, Roots and Blues. Here's the link: http://kellyrfineman.livejournal.com/692277.html. I'm in today with a review of the verse novel The Surrender Tree by Margarita Engle. Over at my blog Political Verses, I have an original poem by J. Patrick Lewis titled "TLC by TSA at LAX." Wow, you guys are keeping me busy with all your great poetry entries this Friday. Keep 'em coming, I'll update again later tonight. @GeorgeBuzzBee - I'm sorry sir, but you look like spam! Not sure if that was your intention, but I'll be deleting your comment later tonight. @Elaine Magliaro - I like your second poem, but even though it's from a children's author, it didn't seem "kidlit" oriented to me, so I've left it out of the round-up, thanks for understanding! I'm sharing the poem In Praise of My Bed by Meredith Holmes. I've also recapped my first week of poetry posts for National Poetry Month. I am posting a new haiku in this form every day in April. Please come visit often! My selection is "A Child's Calendar: poems" written by John Updike with illustrations by Trina Schart Hyman. I always forget to sign up! I'm posting my reactions to Cybils poetry books on Fridays. We loved Mirror, Mirror. Yes, sorry about the delay, and thanks for taking the time to visit on top of the extra hosting load during April. I reset my comment settings last week for the tag poem and forgot to change them back. You're posted now!